I went to an art museum today (the University of North Carolina at Chapel Hill has a rather nice one) and came away thinking about how I haven’t done much art since I graduated, and haven’t made much of an effort to improve my abilities. Yeah, I can pretty much keep making Wanderlust illustrations at the same level I have been, but there are so many things I have yet to learn about color and anatomy and composition. So many ways to improve! My art teachers were always telling me to draw from life, and to draw a lot—very good advice, though I haven’t followed it very well. Maybe I haven’t been “inspired” lately because I’ve been sitting down and staring at a blank photoshop document and trying to create something from nothing, when I should have been looking around me for inspiration. 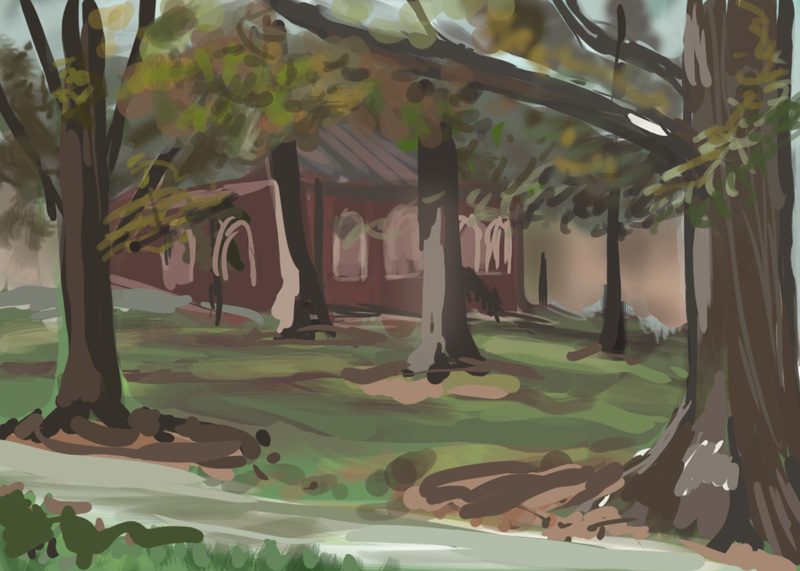 Today, I sat down and made this sketch of the UNC campus. © me. Photoshop, about 30 minutes. Very neat! I like the trees. You definitely have a style. Thanks! Landscapes have not been my strong-point, so I’m trying to get better at things like trees.